About the VII Championship of the Country in Swimmimg in the city of Alushta. Landscapes of the Crimea. Boat rides, water ski athletes in the Black Sea. 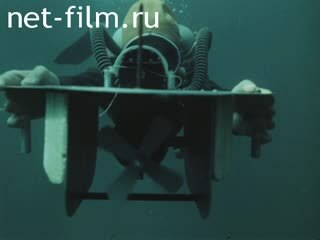 Opening of the seventh championship of the USSR on a scuba diving in the city of Alushta. Participants swim start. Sail athletes submariners. Among them: G. Skorikova, T. Timakova. Yu Naumychev, A. Ivanov and others. Closure of the championship. Handing Champion Cup: Ovchinnikova, G. Skorikova, Kilter, Semenov, Menshikov, Berman. Crimean landscapes: the sea shore - LS. Alushta from the sea - LS. Hydrofoil boats and water skiing athletes on the background of the Crimean coast - LS. Swimmers, divers in front of the Central Club of underwater sports - LS., MS.; Club in the dining room during dinner - MS.; Prepare equipment - MS.
Boat is launched from the hangar - MS. Opening ceremony, the report - LS., PNRM., MS.
Are teams from Moscow, Leningrad, the Armed Forces, the Russian Federation, Estonia and other republics. National champions in 1963 and Igor Yanes Tiyyu Bavrin raise the flag competition. Start swim men at 1000 meters. Athletes swim - LS., MS.
Athlete swimming underwater - LS. Judges with stopwatches - MS. Participants swim finish - LS. The audience applauded - MS.
Start, swim and swim finish women's 500 meters - different. Hands of judges with stopwatches - CU. Converse group swimmers - MS.
Leningradka G. Skorikova - CU. PNRM. from boats along the coast, which brought together a lot of visitors. Starter with a flag in the boat - LS. The starter gives the signal - MS. Distance of 25 meters, dives, and then out of the water Galina Skorikova. The judges in the boat. Swimmer under water - MS., PNRM. Swimming under water, then emerges from Estonia athlete Tatyana Timakova (best time - 12 seconds). Spectators on the beach - MS. The girl in a bathing suit. Looking through binoculars - CU. Exercise for Men at a distance of 40 meters. Diving, swimming underwater and emerges champion of the country in this exercise Yuri Naumych. Dives and comes up Muscovite Anatoly Ivanov (both shown the result of 19.9 sec.). Athletes at the beach - LS., PNRM. Three athletes on the shore, one of them drawing on the slalom circuit scuba - MS.; His hands with a ruler and pencil on the scheme - CU. On the shore of athletes Menshikov, Efremov, Semenov, Skorikova, Kilter with engineered devices expect them underwater slalom course. Athletes with the devices on the shore - LS., MS.
Captain of the team that won the gold medal in the competition for the European Cup in Italy in the summer of 1964, Vadim Efremov shows fellow photography. Hands holding a photograph - MS.
Menshikov of the photos - CU. The starter gives the signal for the start of the underwater slalom. Starts athlete swims with the device under water is the goal. Floats on the water indicator buoy - LS., MS. Swimming underwater athlete with the device, is the goal. Waving a flag starter - LS. The athlete with the instruments. The athlete with the devices before starting. A swimmer dives into the water - LS. Throw indicator buoy - LS. The judges in the boat - LS. Athletes swim under water, give signals, meet and swim together, found the whole team at the specified location. Monitoring buoys in the water. Judges at a table on the beach. The team goes to the shore. Leningrad athletes who won the team competition on the results of all exercises, hand cup. Representatives of the winning teams - Leningrad, Estonia and Moscow - on the podium. Champion in the individual competition of women Ovchinnikov (RSFSR), Skorikova (Leningrad) and Kilter (Estonia) on the podium. Applauds team of Moscow - MS.
Champion men Semenov (Armed Forces), Menshikov (Moscow) and Berman (Ukraine) on the podium, put on tape Semenov champion. Athletes - two boys and a girl - CU.